Bonikowsky, Laura Neilson. "The Battle of Batoche and the North-West Rebellion". The Canadian Encyclopedia, 25 January 2019, Historica Canada. https://www.thecanadianencyclopedia.ca/en/article/battle-of-batoche-feature. Accessed 20 April 2019. "Fire, in the name of the Father! Fire, in the name of the Son! Fire, in the name of the Holy Ghost!" Louis Riel, armed with a crucifix, led his followers in the Northwest Rebellion, which culminated with the Battle of Batoche from May 9-12, 1885. "Fire, in the name of the Father! Fire, in the name of the Son! Fire, in the name of the Holy Ghost!" Louis Riel, armed with a crucifix, led his followers in the Northwest Rebellion, which culminated with the Battle of Batoche from May 9-12, 1885. 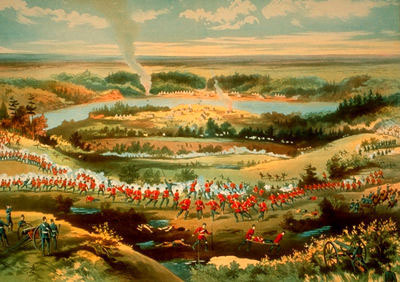 Fewer than 300 Métis and First Nations people led by Riel and Gabriel Dumont faced the 800-strong North West Field Force, commanded by Major-General Frederick Middleton. Disaffection in Saskatchewan was growing, largely because of long-distance government. Prairie land was regulated by the Department of the Interior, whose ineffective officials were ensconced in Ottawa and Winnipeg. Saskatchewan was unrepresented in Ottawa. Among indigenous people and Métis, resentment grew as their way of life succumbed to white settlement. The repeating rifle, wielded by whites and natives alike, had decimated the buffalo herds. The Métis role as carriers and freighters for the Hudson Bay Company was superseded by steamboats and further threatened by the advancing railroad. The Métis did not take well to agriculture. Their appeal to Ottawa for help in adjusting to farming was ignored. At the Batoche settlement, surveyors prepared for new white settlement by dividing the Métis' land, just as they had done at Red River 15 years earlier. The Plains Indians, not understanding white laws and language, accepted treaties without realizing they were relinquishing their lands. White settlers were angered by what they considered unfair treatment by the federal government, especially its decision to construct the railroad 100 miles south of the original route. Many settlers bought land close to the proposed line between Winnipeg and Edmonton. But in 1882 the CPR changed its plan, running the line through Regina and Calgary. The Métis and English-speaking First Nations united to plead with Riel in 1884 to return to Canada from the US, where he had been banished for his role in the Red River Rebellion and execution of Thomas Scott. Whites welcomed him too. The federal government ignored Riel's main weapon, a petition. In January 1885, Riel, declaring himself a "Prophet of the New World," proposed armed rebellion. On March 19, Riel, with armed followers, occupied Batoche's church, formed a provisional government naming himself president and Dumont military commander, and demanded the surrender of Fort Carlton. The Métis took prisoners in Batoche and occupied nearby Duck Lake. Riel believed that this blackmail, so effective in Manitoba, would work again. But Sir John A. Macdonald would have none of it. The nearly-completed railroad gave him a reason not to capitulate this time. In 1870, Riel had been the master of Manitoba and Macdonald had had no choice but to negotiate. But in 1885 the railroad facilitated military defence. Macdonald had troops unloading at Qu'Appelle eleven days after the first shots were fired at the North West Mounted Police at Duck Lake on March 26. Riel led his rebels along the Saskatchewan River, defeating white settlers and increasing his troops as he went. Their progress was aided by military commanders' poor decisions, the small size of Frog Lake's police garrison and the advice of a Hudson's Bay Company agent who disastrously persuaded the civilians to offer no resistance and trust the mercy of the First Nations. Dumont led his warriors in guerilla warfare, using their mobility and knowledge of the terrain to advantage. Dumont would have preferred to engage Middleton's forces elsewhere, but Riel, believing God sided with the Métis, chose to make a stand at Batoche. The Métis and their allies, despite smaller numbers, offered remarkable resistance to the militia. Middleton initially planned a combined water-and-land attack. His plan was scuttled when the Métis disabled the riverboat Northcote by lowering a ferry cable across the river, taking down the boat's smokestacks. For three days the fighting consisted of volleys and sniping, but Middleton had the advantage of numbers, better artillery and a Gatling gun. He hesitated, unwilling to throw his men into harm's way and essentially waited until the enemy ran out of ammunition. On May 12, Middleton planned to draw the Métis toward a small force while assaulting with the majority from the north. 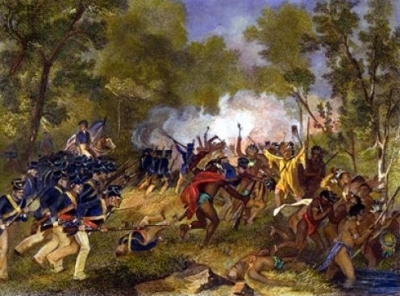 The officer commanding the larger force was to launch his attack when he heard Middleton's guns. The strong wind prevented him from hearing them. Middleton, miffed, stomped off to camp for lunch, unaware that the manoeuvre had worked despite being delayed. In minutes, the fight was over. The Métis retreated. On May 15, Riel surrendered, but Dumont and a few others escaped to the US. The government had to decide what charges to press against Riel. While his followers had committed murder, Riel had not. He had raised an insurrection, and ultimately was charged with treason under an archaic 1352 statute. Riel was convicted and sentenced to death, even though the jury recommended mercy. He was hanged on November 16, 1885, at Regina.